‘…that’s the vein that I want to be in. Mainstream music is writing that music for high school/college students. But that’s what their parents are listening to at work and on the radio. Everyone is listening to it…[In short], we’re going to get down a little bit. At the same time, I feel provoked to do something. I want it to be multi-dimensional. I want them to leave inspired, but also asking questions: What do I do next? What does what I’m feeling mean, and what do I do with it? I feel like at that point, we can give them a vision: Here are ways you can express your gifts. I feel like the music is the runway to taking people somewhere…’ Tauren Wells. Former lead singer of Royal Tailor. Now a solo artist signed to Provident Label Group. Now let us backtrack a little bit… Royal Tailor, formed in 2011, was a moderately successful band that produced hit singles like “Hold Me Together”, “Make a Move”, “Ready Set Go” and “Making Me New”, to name a few. They sold out arenas and went on tours with artists like Capital Kings, TobyMac, and Building 429…yet without warning, the band stopped touring. And while no official statement was made about the disbanding of the quartet until Tauren stepped out and released a new single, his first as a solo artist; it was unfortunate to see the band travel their separate ways, even if it meant for them to explore the other avenues that God had in store for their lives. While I reckon Royal Tailor’s best album was still to come, we would never know. 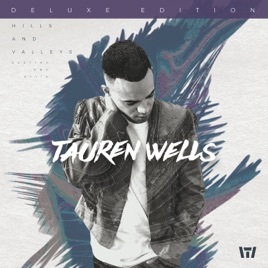 Nevertheless, Tauren Wells, former lead singer of the band, is still making music, and his first solo full-length album Hills and Valleys released a few days ago. Standing at 15 tracks on a digital-only deluxe edition (the physical copy of the 11 track standard edition will release in July), the sound of this new project that Tauren has embarked upon is…well, it’s like Royal Tailor never disbanded. Just like how Audio Adrenaline 3.0 with Adam Agee on lead vocals sounds like a pop/rock version of Stellar Kart, or how Newsboys at times remind me of the good ol’ days of DC Talk; Tauren’s new solo effort is everything I could’ve hoped the next Royal Tailor album to be. Still, it is a bittersweet offering, and a reminder that any band formation can easily result in band splits in the future, be it amicably or not. Building upon the successful releases of his Undefeated EP in September 2016 alongside his Hills and Valleys Single in January 2017, Tauren’s first official album is one to savour if you have thoroughly loved Royal Tailor and their music, or if you love the sound and music of similar styled mainstream artists, like Michael Jackson, Justin Timberlake, ONE Republic or Bruno Mars. In fact, mix those four artists together in a blender and add a faith element, and that is how Tauren’s new album sounds like. Or if you aren’t really into the mainstream, then I guess Hills and Valleys would be reminiscent of other similar styled CCM artists, like Group 1 Crew, 1GN, TobyMac, Hollyn, or Royal Tailor themselves! Nevertheless, these 15 songs are packed full of hope and encouragement- from “Undefeated” featuring rap sensation KB, to the pop radio friendly track “Love is Action” and the emotive and uplifting single “Hills and Valleys”. Just once glance at the track list and you may start to think, ‘gee, some songs look familiar’. And while one could say that adding songs on a full length album that was once on an EP previously may seem just like lazy song-choosing, what I reckon is this- that songs like ‘Love is Action’, ‘Undefeated’ and the up-and-coming chart-topping ‘Hills and Valleys’ are no brainers to be included on this new project by Tauren, even if we have heard them on Undefeated EP. Released in the first half of 2016, ‘Undefeated’ is by far one of Tauren’s most stylistically diverse songs on the album, as it features rap sensation KB on a song that stretches the boundaries of what it means to collide the two genres of pop and hip hop. While this song may not necessarily sit that well with listeners of radio stations like K-Love (and would probably be welcomed much more by listeners of Air1); Tauren nevertheless addresses the topic of us being undefeated when we are in Christ Jesus, tackling the issue of how at times, we may worry about whether God actually has things under control, when in fact all we ought to be doing is to trust- trust that He in fact wants us to be in the place we’re in at the moment for a reason- often it may be a reason we don’t understand, yet a reason nonetheless. “Undefeated” is a unique pill to swallow if you are an avid listener to K-Love and a much more radio friendly music atmosphere, yet Tauren and KB infuse together the genres of pop and hip hop quite nicely and remind us all that we are undefeated. In Christ Jesus we have the victory, and this well-choreographed song is one for us to reflect upon and be reminded of that very fact. And then there’s ‘Hills and Valleys’. Released within Undefeated EP and released as the second radio single from that EP, and then re-released again in January 2017 alongside an acoustic version and a remix version (that is also present on this project! ), the song features a more subdued atmosphere as Tauren reminds us all that God is a God who is present during both our highs and our lows. He is God of the hills- the high moments, the up times where nothing can go wrong, and is also God of the valleys, the low moments when all we just want to do is hide ourselves away from the world. A song that gives us comfort, us knowing that He is our constant even when everything else is changing; “Hills and Valleys” is all but assured its spot in the song track list of WOW Hits 2018 releasing later on this year (that is, unless the powers-that-be decide to not put on ‘Hills and Valleys’ on WOW 2018- of which will be a puzzling decision!). No but really, in all seriousness, ‘Hills and Valleys’ has been one of my favourite songs to listen to of late- and has been one of my favourite songs to be released in 2016. While to be honest ‘Hills and Valleys (The Hills Remix)’ is a little unnecessary- when in fact this version is eerily similar to the original recording, except with the addition of more looping percussion and an added electronic presence (all of which could’ve been done away with and the impact still be the same! ); it is the unique ‘Hills and Valleys (The Valleys Version)’ that is unique and in fact enhances the song quite a bit. Released with just the piano and cello, this reflective moment of tranquillity and worship is a timely reminder of such themes like humbleness, and a knowledge that God is presence in all circumstances. It is a gentle reminder of God’s commitment and dedication towards us, that He will pursue us up the hills and down the valleys so that we can be brought back to Himself, all the while understanding and knowing that we are loved beyond comprehension. Throughout the rest of the album, Tauren continues to pursue down the avenue of pop meets worship in the same stylistic vein of similar mainstream artists like Justin Timberlake and Bruno Mars, following on from his 4 tracks on the Undefeated EP. Starting off with the energetic radio friendly ‘When We Pray’, Tauren encourages us to utilise the power of prayer, that when we pray, ‘…all the world starts changing when the church starts praying, strongholds start to break…prison walls start shaking, at the sound of praising, nothing stays the same…’, and while we see that this song isn’t the first recorded and sung about the topic of prayer, it is nevertheless a track that is as much needed in this economic and political climate as it is needed in lives of individuals at this very moment. “When We Pray” may often sound formulaic in music and style (be prepared to hear this song on Air1 in the future…maybe), but the message is far from that. A great way to start off the 15 track album, Tauren utilises and promotes what he does very well in this track- pop a la JT or Bruno with an inspirational message attached. And if that can bring in listeners of Justin and Bruno’s music and show them a similar styled music with a unique and different message attached, then maybe, just maybe, Tauren is doing something right with his music. ‘Nothing But You’ stands at 4:37 and slows down the tempo quite a bit, as Tauren presents a track that is void of most instruments aside from looping percussion and keys. The song presents a message of how there is nothing and no one aside from the Lord, and with the addition of up and coming rapper Davies, we are reminded yet another time that the musical genres of rap and pop and fuse together and live together side by side in a song that presents the best of what these musical genres have to offer. With light electric guitars, ‘Known’ is quite possibly one of the most vulnerable songs Tauren has ever written, as the message of being known and loved fully by the Lord is touched upon in this song. To be known and loved can be a scary thing- but rather it ought to be the opposite. As the Lord knows our innermost parts of us, we don’t have to fear or be afraid of our secrets or desires, but rather come to the Lord with our grievances and questions, knowing full well that He knows us as well as knowing what is best of us too! Tauren also brings to life themes like dedication and giving all of ourselves to Christ (“All My Love”), and reminding us all that He is the only reason for the supernatural feeling we can often feel in moments in our lives when all that can be explained in such situations is just- GOD (“Supernatural”)- all the while sounding in this track especially like The Bee Gees back in the day! Tauren also covers Earth Wind and Fire’s “September”, and records it quite nicely as well. Though this version sadly doesn’t surpass Kirk Franklin’s gospel rendition of the hit that he also recorded way back in the late 2000s, what Tauren has going for him is staying very much true to the original song. Here’s hoping that people who were fans of Earth, Wind and Fire will listen to ‘September’ by Tauren Wells and maybe check out more of his music! And then there’s ‘God’s Not Done With You’ and ‘All About You’, two songs that I reckon, along with ‘Hills and Valleys’, will continue to propel Tauren and his solo career to newer heights in the upcoming weeks and months ahead! The former (which also has a demo version of the track on this 15 song album…which doesn’t really differ that much from the original except that it is much more piano led compared to the radio-friendly original) is an anthem and prayer that Tauren presents with such fervour and passion as the message of God not being done with us, especially during the moments when we think He has abandoned us during our pits of trials and despair; while ‘All About You’ features guest vocals of the up-and-coming artist Hollyn in a track where the message of life being all about God and all about His life, hope, provision and encouragement for each of us, is conveyed and highlighted through this song. It is the chorus that hits the nail on the head in terms of its theme- ‘…Your name, Your glory, Your fame, Your story, it’s all about You…’ This life and our story isn’t really about us- but rather, we were created to reflect His love and to show that He and He alone will satisfy and comfort even the most broken-hearted in whatever circumstance they find themselves in. A song full of energy and passion exuberating from both Hollyn and Tauren through this track, I expect ‘All About You’ to one day become a radio single…maybe later on during the year? Well done for such a collaboration as this, one of my favourite duets since Tenth Avenue North and KB (and Derek Minor) and their song ‘For Those Who Can’t Speak’! Tauren’s first solo effort is nothing short of powerful and unique, as he continues to remind us that even if a band ceases to exist, that doesn’t mean that the members (or in this case, the lead singer) also disband from music as well. Just like how Peter Furler continued music after his own departure from the Newsboys, so has Tauren Wells shown us that his time serving the community and ministering to others through music is not done yet. While I am still wondering as to why Royal Tailor broke up (the real reason, not necessarily the official one); Tauren’s first album still impresses, and continues to be a collection of songs that’s going to be continually on my Spotify and/or Itunes Playlists in the upcoming weeks and months ahead. One of my favourite albums of the year? Most certainly. Well done Tauren for such a powerful first album, and one to listen to if you loved Undefeated EP and want to listen to more of the same…or if you really miss Royal Tailor and want to see if Tauren’s first effort is like the band in terms of music, lyric, song and style, or not!